Get used to using the mouse on your computer. Now change the sensitivity of the mouse. Practise for 10 minutes until you can accurately click on things again. Now turn the sensitivity back to how it was to being with. You should find that when you change the sensitivity settings on your mouse it feels all wrong and you repeatedly over- or undershoot the icon you are looking for. But, as you practise, you get better until the new settings begin to feel normal. Then, when you change things back to how they were when you started, everything feels wrong again for a while. We did something very similar on the show. We got Ben to try throwing a ball at me. To start with his aim wasn't bad. He then put on a pair of prismatic glasses, which bent the light coming into his eyes by about 15°. This put his aim off until he had practised for 5 minutes, at which point his accuracy returned and he could hit me again with the ball. But when he tried with his left hand, with which he hadn't practiced since putting on the goggles, he was still way off. He then took off the goggles. But now his right hand began missing me again, and in the opposite direction. When you decide to throw a ball, your conscious brain sends instructions to your cerebellum. This is a fist-sized brain region at the top of your spinal cord. The cerebellum translates movement instructions into a series of signals that activate individual groups of muscles at just the right movement to achieve an accurate throw. The cerebellum continuously compares the outcome of these actions with what was intended. If the movement had the desired result, the cerebellum will use the same set of signals next time it is told to throw the ball. But if something about the throw goes wrong, based on how the movement failed, the cerebellum will adjust its behaviour the next time to produce a slightly different movement. If this leads to an improvement it will do it again. This means that if you do something odd like changing the sensitivity of your mouse pointer, or start wearing goggles which move your view of the world, then your cerebellum will adjust the strength and timing of the nerve signals it processes to improve the accuracy of the movement in future. However the learning only works for movements you have practised. If you try another limb, or a different movement, it will not have been optimised like this. 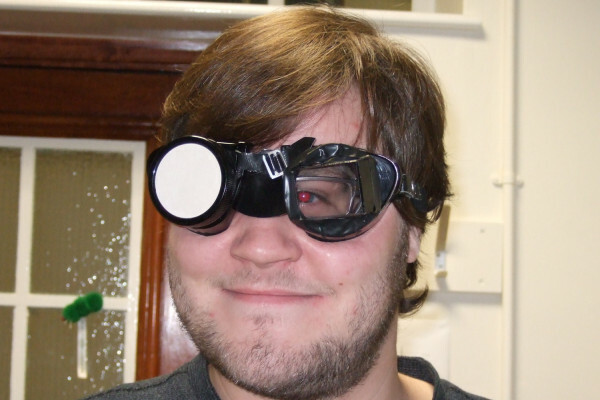 So if you take the goggles off, or change your mouse settings again, the unpractised limb will work fine, but the practised once will now be compensating for an adjustment that is no longer required and will have to learn how to do the movement again!